Download Les Miserables in Digital HD from the iTunes store. Les Miserables images are © Universal Pictures. All Rights Reserved. Not many musical plays get translated to screen with pleasing results and Les Miserables barely makes the cut. The lavish film production of the heartfelt story wins with sets, music and cinematography, but not desirable enough in the acting development. While the strongest performances come from support characters the leads just couldn't make the grade with the vocals. For stage production purest, this may not be your cup of movie magic. 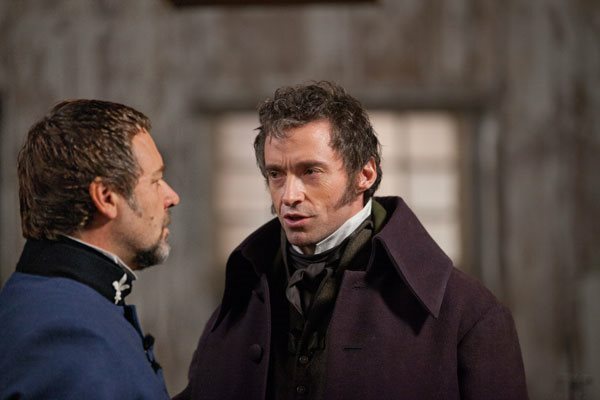 The light opera opens with Jean Valjean (Hugh Jackman) on the day of his release from prison for stealing food. Tired and crushed by seventeen years of incarceration, Valjean jumps parole and makes his way to a small town where he gets befriended by a priest who allows him to steal valuable items and start a new life. Hunted by Inspector Javert (Russell Crowe) for breaking the law of his conditional release, Valjean finds himself avoiding major French cites and settles in one where he finances a factory and becomes its mayor. In a quark of fate Javert gets transferred to Vanjean's town and narrowly misses capturing his quarry. When Valjean gets confronted by Fantine (Anne Hathaway), an ailing factory worker of his who was fired without his knowledge, he agrees to care for her illegitimate child Cosette. So starts an adventurous journey of hide and seek that leads to a remarkable resolve. Most musicals do not have a lot of story and audiences accept this because the vocals by the actors overshadow any need for a lot of drama. In Les Miserables the story plays a major role spanning three decades of liberty, romance and justice. In this production you may need the drama however, because music delivery by both Jackman and Crowe are not top notch. I am not impressed with their singing voices and because of this do not reflect the characters they portray. While costumes and sets are perfectly directed, it's not the clothes or locations that make the performances work, it's the musical perfection needed for Valjean and Javert. That said, support actors do provide amazingly good performances that helps keep the film from sinking to non-recovering depths. I will just say it; Anne Hathaway as Fantine and Samatha Barks as Eponine save the show. Their scenes are commanding, heartfelt, and infectious with vocals that top anything I've seen in film related musicals with the exception of Phantom of the Opera. In a scene with Fantine after she's been coerced into becoming a prostitute we see her near death. Hathaway's screen presence kept me glued to the screen listening to her haunting delivery of "I Dreamed a Dream" while watching her soulless features. Barks plays a pivotal role of Eponine a teenager who as a child lived with the now teenage Cosette. The two are in love with the rebel leader Marius, but he has eyes only for Cosette. Valjean finds that he is in danger of being caught by Javert and wants to flee Paris and take Cosette to England. Cosette sends Marius a note giving it to Eponine for delivery, but she decides not to give it to him. Feeling despondent Eponine opens her heart with "On My Own", Bark exquisitely performing one of the best musical ballads in the film. I must admit I could really feel her hurt come off the screen. Direction by Tom Hooper (The King's Speech) although extremely good with his support cast, falls a little flat with having to work with leads Jackman and Crowe who should do what they do best and stay out of musicals. While the movie plays out well with a very good support cast, they are nothing more than a band aid on a deep wound. That said, the choreography and familiar music are nicely directed, sets are perfect for the French period and costumes are just right to make the characters fit into the 1800's French time frame. The film has been rated PG-13 by the MPAA for suggestive and sexual material, violence and thematic elements. 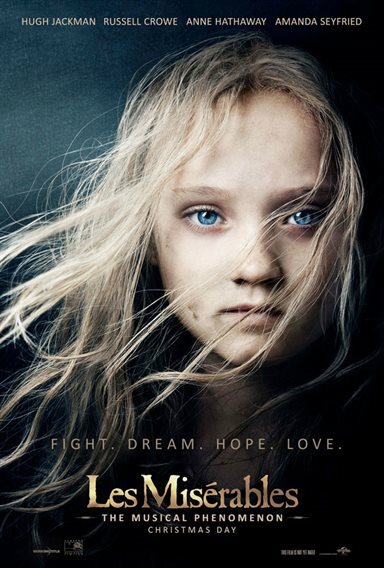 Les Miserables images © Universal Pictures. All Rights Reserved.